The Buckle Street underpass has been finished and the building of Pukeahu National War Memorial Park is underway. The park will be finished by the end of March 2015. 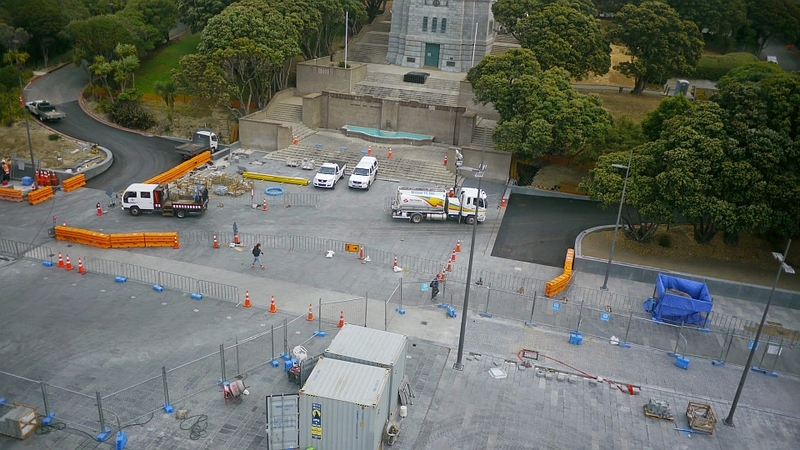 The building of Pukeahu National War Memorial Park is nearly finished. This has been a three year project where roads have been built, changed, upgraded and put underground in the Buckle Street underpass. The project will be finished early and will be almost complete in time for the fourth and final LEARNZ field trip in March 2015. You were able to drive through the new Arras Tunnel and find out why it was named 'Arras'. You visited the TOC (Traffic Operations Centre) at Johnsonville to see how the roads in Wellington are monitored to keep drivers safe. You also looked at the software used to monitor traffic, fire and ventilation in the Arras Tunnel. Now that the underpass is finished you saw how the park above the tunnel is taking shape. You saw the relocated historic Home of Compassion Crèche on its new site in the park. You found out about plans for Anzac Day 2015 at Pukeahu National War Memorial Park and how you can get involved in WW100 events in your own local area. Take a look at Field Trip 1 in November 2013 to see how the project has progressed. What is happening at Memorial Park at the moment? During January and February 2015, Pukeahu National War Memorial Park has been turning green as trees and plants have been added. Turf for lawns will be laid at the end of February. The entrance pavilions will be completed. The Tangata Whenua Gardens are being made. The Australian War Memorial is being built, including red sandstone blocks being fitted in the centre of the park. The Home of Compassion Crèche restoration is underway and landscaping will begin soon. A path across the park has been opened to allow foot access for people. Road works in the area continue. During the fourth field trip you will see the finished park, help plan for Anzac Day 2015 and take part in the dawn ceremony to bless the park. Outside the Carillon you can see the paving that is being laid in the park. Image: NZTA. Red Sandstone is being placed on steel columns as part of the Australian War Memorial in the park. Why do you think there is an Australian War Memorial in this park? Image: NZTA. The park is slowly turning green as trees are planted. Can you see the rain gardens - how do these work? Image: NZTA. The Home of Compassion Crèche restoration is well underway and landscaping will soon begin outside. Where did this building used to be located and how was it shifted? Image: NZTA. The Arras Tunnel has been open since September 2014 allowing work on Pukeahu National War Memorial Park to begin. Image: NZTA. This is an artist's impression of what the park will look like when it is completed. Image: NZTA. 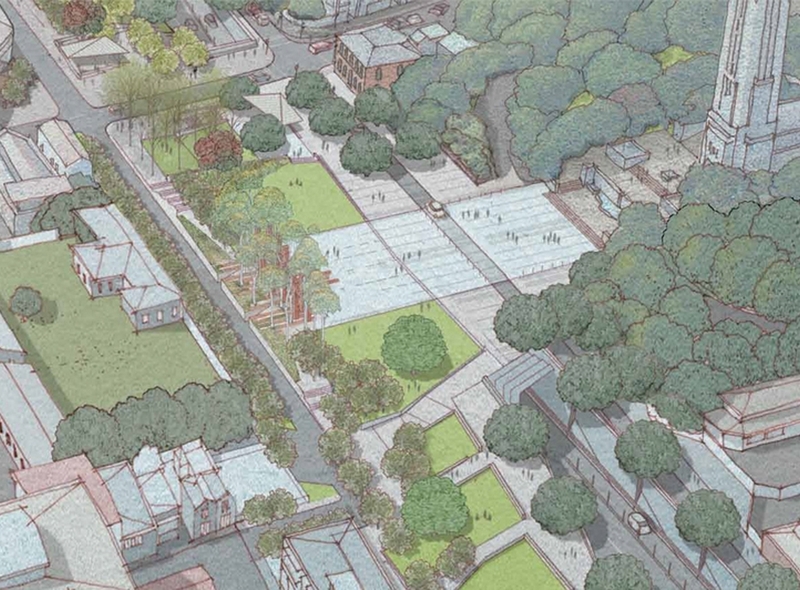 Take a look at what Pukeahu National War Memorial Park will look like when it is finished on the NZTA website. Think of what you might add to, or change, about the park to show your ideas of how your class can remember those who have served at war.